Opening Nights is a black comedy entwining the lives of people involved in theater. Pulitzer-Prize winning Janet Burroway has very original style, and readers will not need to be a fan of theater and drama to enjoy this novel. 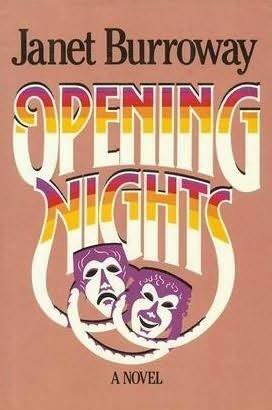 Opening Nights shares the stories of the lives of a few core characters: flouncy costume designer Shaara Soole, her ex-husband and theater director Boyd Soole, Boyd's new, young wife Wendy Soole, and Gene Keyes, a low-class laborer vying for Shaara's affections. Each character is quirky but we come to love all of them for their odd ways. Wendy has super exciting and crazy experiences; while Shaara's struggles to accept Gene into her life are equally comical. Opening Nights is raw, sarcastic, and gross at times, which makes it uniquely charming. Details on Boyd's play are an afterthought and not as much as a focal point in the story as readers might initially think. The kookiness and climax of Opening Nights is shocking and unforgettable, and readers will put the book down with a wry smile on their faces. Although the book was published in 1985, its material is not time-sensitive and can definitely be considered classic. Janet Burroway has great talent and after many years of taking a break, recently released post-9/11 novel entitled Bridge of Sand .